Special Ben & Jerry's: Margarita Pie. Ben & Jerry's isn't exactly novel. I've reviewed Ben & Jerry's fairly extensively before, and a few weeks ago I even reviewed some of the Ben & Jerry's flavors that I recently consumed in Europe. So I'll skip all the basics. You know Ben & Jerry's. 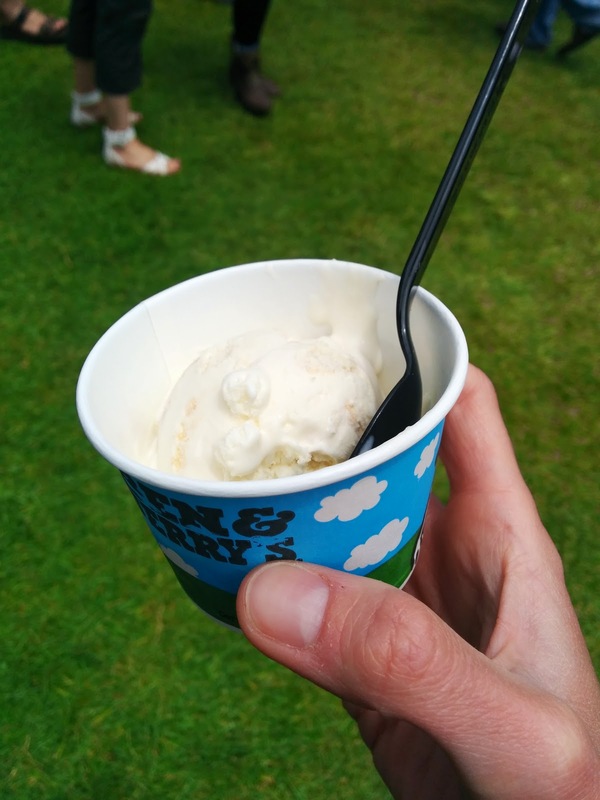 I recently attended Chipotle's Cultivate Festival in San Francisco, and at the event, Ben & Jerry's introduced a special flavor: Margarita Pie. It was available at the festival only, a one time thing. Margarita pie was described as lime ice cream with shortbread-crust crumbles and "gooey tequila-marshmallow swirls." Now, I don't really like lemon or lime desserts. But, this was a one time opportunity, I had to take it, right? I can't resist trying more ice cream. Let's just say, trying out this limited edition flavor was most certainly not worth the wait, at least for me. The ice cream base was indeed lime-y, and did taste a fair amount like a margarita. Which, if you like these things, might be good. It was loaded up with generous chunks of the shortbread pie crust, which added a good texture. I appreciated the distribution of the chunks, how many of them there were, and the seemingly perfect size of the chunks, but they paled in comparison flavor-wise to the graham cracker cookie crumble in the Strawberry Cheesecake flavor I just recently had. As for the "gooey tequila-marshmallow swirls", I didn't find anything that I'd identify as gooey. Or tequila-y. Or marshmallow. Or a swirl for that matter. So, yeah, no idea where those were supposed to be. Overall, yes, this was lime ice cream with some shortbread crumbles. Which was fine, just not particularly exciting to me, and I felt cheated of my marshmallow swirls! There are certain foods, like yuca and taro, that I sometimes get really random cravings for. Something about the starchiness just calls out to me, in a way that no potato ever can. 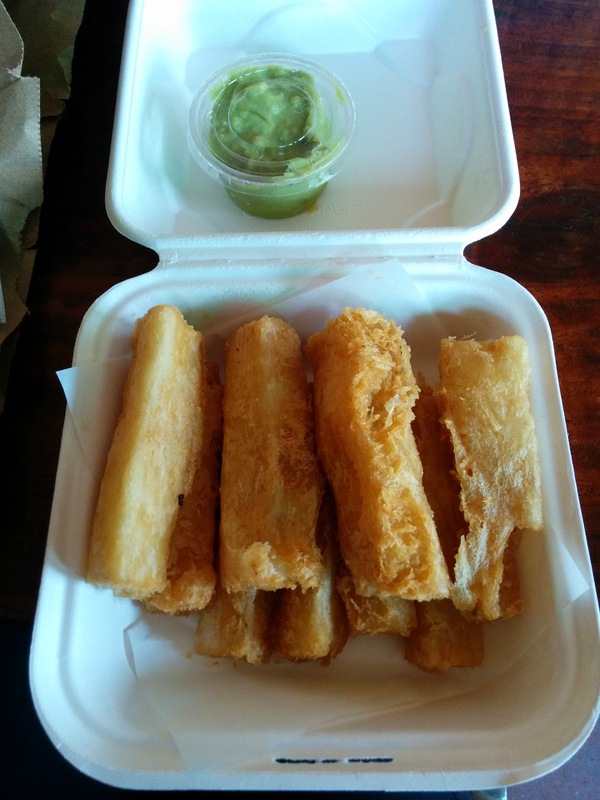 I've tried yuca fries at a few places, but I haven't been impressed, like the greasy, starchy, poorly cooked ones at Destino, or the better, but still not memorable, ones from Limón. Thus, my great yuca fries quest, like so many of my quests, continues. This time, rather than Peruvian, I went for a Venezuelan rendition, and headed to Pica Pica Arepa Kitchen, in the Mission. They have two other locations as well, one in the Castro, and one up in Napa. I think the Mission one is the original, and although I hadn't ever been in, I've seen it from across the street while waiting, waiting, and waiting at Little Star. As you can probably guess from the name, Pica Pica’s signature dish is arepas, but I had eyes only for the yuca fries. (Well, that isn't entirely true, the plantain and taro chips also called out, as did the yuca beignets for dessert). They had a few other starters, and some salads as well. Everything is gluten-free, as in, really gluten-free, no chance of contamination, if that matters to you. I placed my order through eat24 when I was a few blocks away, and then swung in to pick my order up. I had a very short wait, which I expected, as I intentionally placed my order when I was too close, since I wanted to guarantee that they'd be hot and fresh, not sitting around waiting for me. During my brief wait, I took in the surroundings. The first thing I noticed? The sign proclaiming that they'd been featured on Diners, Drive-ins, and Dives. Not exactly a selling point for me, but I also knew Yelpers love the place (although, hmm, also not really a selling point!). Pica Pica is a casual establishment, if I hadn't already ordered in advance, I'd order at a register, and take a number back to my table. There were a decent number of tables for 2-4, and a counter with seating for singles. Arranged at each table were silverware, napkins, and some condiments. Up front near the register was a dispenser with little water glasses, self-serve. Food was delivered to the table when ready. The place seemed fairly busy, as I had to wait in line to receive my order, and there was a constant stream of people arriving. And as I said, they've expanded to three locations now. They must be doing something right. Unfortunately, the yuca fries are not it. Yuca Fries with Guasacaca Sauce. $4.95. I'm glad I opened my box before leaving. It contained the yuca fries, as I expected, and a side of sauce. The menu had specified different sauces that came with the other sides, but said nothing about the yuca fries. For me, half the reason I get anything fried is just to have an excuse to try out dipping sauces. I'm a sauce girl, whether it be dipping sauces or sauces on food, they are often the highlight of a meal for me. So, sauces matter. But this sauce looked an awful lot like guacamole. And I knew that several other dishes, like the plantain and taro chips, come with guasacaca sauce, which is,basically guacamole, but without tomato. And I'm allergic to avocado. Very good thing I checked! I found guasacaca to be a strange sauce to serve with yuca fries, particularly as all the Yelp reviews I had read talked about dipping into sauces. It turns out, they have 4 house made sauces on each of the tables, but none of those were included in my togo order. Nor were there little containers available to put them in. If I were a Yelper, I'd angrily dock them a star for not including sauces, and another for not having it possible to help myself to them. Anyway, I didn't try the guasacaca obviously, but their website describes it as "avocado, red onions, green peppers, garlic, cilantro, lime and a splash of our secret Pica’pun hot sauce!" I brought it home for Ojan, who used it as a spread on something else, and he seemed to enjoy it. But back to the yuca fries. They were indeed clearly fresh, piping hot. But they were soooo oily. So, so oily. I like fried food, but these honestly seemed like they hadn't been drained at all. Just touching one left a layer of oil on my fingers that I couldn't wipe off. I set one gently down on a napkin, and it soaked through instantly. Minus another star? The fries also just didn't taste like anything, and had no interesting texture. They somehow managed to not be very crispy on the outside, and inside was just mush. No starchiness that I like from yuca fries. The inside was pretty much indistinguishable, taste-wise, from french fries or mashed potato. My order contained 8 fries. Yes, they were large, but 8 fries for $4.95? (And yes, there really were 8. I realize the photo makes it look like there were 9, but two of them were only halves!). Too expensive, and way, way too greasy. I only ate half of them while they were hot, and brought the rest home. I'm not entirely sure why I did so, as they weren't good even fresh, but ... I hate wasting food, and I was thinking that perhaps I could at least crisp them up in the toaster oven, and perhaps squeeze out some oil while I was at it. But instead, the oil soaked in. And ... I decided to just eat them cold. I know this sounds like a recipe for certain dissatisfaction, but somehow, I actually liked them a lot better this way. Not that I'd go get them again, but ... much better this way! 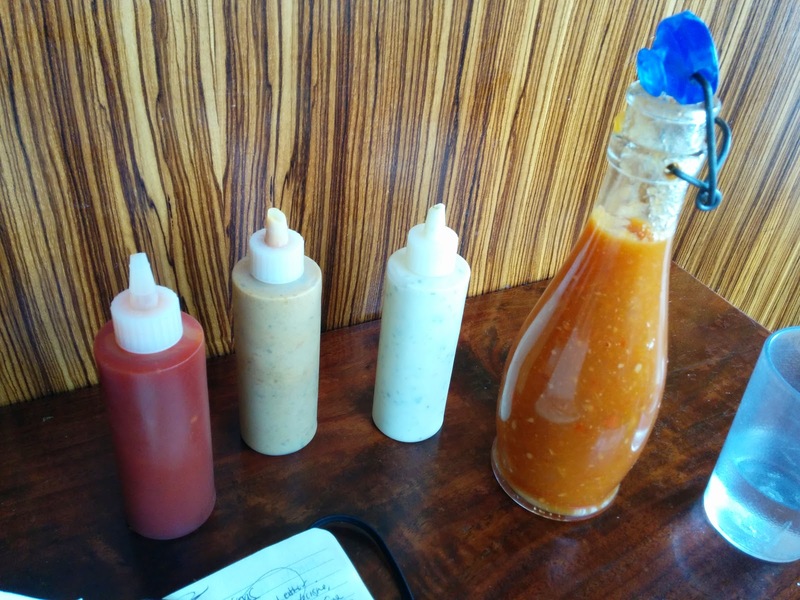 As I mentioned, there were 4 sauces on the tables, 3 in squirt bottles, 1 in a glass jar. Since I couldn't eat the avocado based sauce, and I knew Yelpers loved these sauces, I tried them all out. Of course, I had to just squirt them all into my box, and very carefully carry it so they wouldn't get everywhere, which only quasi-worked. I wound up with a pretty big mess. Again, they lose points for not providing the good sauces WITH my fries. None of the sauces were labelled, so I tried them all, took notes, and looked them up online later, finding the answers in one of their blog posts describing how when they developed the restaurant. Apparently the addition of sauces isn't standard in Venezuelan cuisine, but us Americans, used to having sauces, particularly with Mexican cuisine, demanded them. So, they now provide sauces. The squirt bottles were really gross, incredibly sticky, even worse than the salsa ones at Nick's Crispy Tacos. Given how insanely oily the yuca fries are, I understand how everyone's fingers are coated in grease, and that makes the squirt bottles nasty, but ugh. Really gross. Pica’chup: This is their version of ketchup, described as "smokey". I thought it tasted mildly like curry, and it reminded me a little of the maggi ketchup from Curry Up Now, although I liked the maggi ketchup more. The spicing in the Pica'chup was more subtle and mild. My least favorite of the sauces. Pica'Pun: This is their signature hot sauce, made with habanero. Since I had no idea what any were, and this one looked like creamy mustard, I was surprised by the spice level. But it was quite tasty. It reminded me most of a tartar sauce, as it had flavors sorta like capers or relish in it. But, a bit spicy. The oil level from the yuca overpowered this sauce, which was unfortunate, as it was quite tasty. I think it would be particularly fantastic on fried fish. My favorite of the sauces. Garlic Aioli: This was a very herby, creamy sauce. It reminded me of boursin cheese actually. But I think it was garlic aioli, even though I didn't necessarily taste garlic, and it was thicker than a standard aioli. And uh, a bit cheesy. Mojo: This was actually the spiciest one to me, and it was very runny, so basically got everywhere in my box. Described as a "spicy pickled sauce (carrots, onions, garlic)". I didn't necessarily pick up on any particular flavor, but it was spicy, and added some depth to the creamy white sauce. 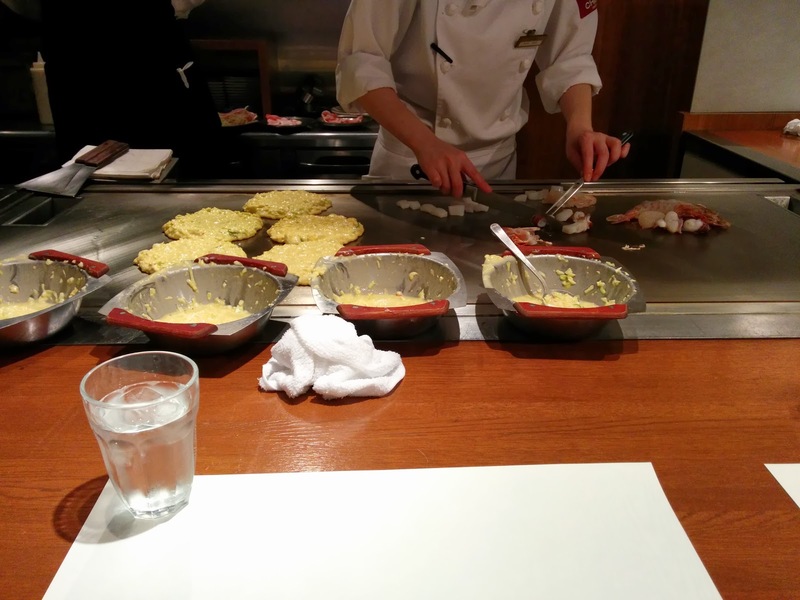 During my recent business trip to Tokyo, one of our co-workers lead us to several lunches as a group, so we could experience real Japanese cuisine, rather than just the fancy Michelin stared meals that I lined up. The first lunch was mediocre ramen, at BeeHive. Next, he took us to President Chibo, a restaurant specializing in okonomiyaki. Chibo is part of a larger chain throughout Japan, although nothing about it really struck me as "chain-like". I'm not all that into okonomiyaki, but I was more excited for this than the ramen, since I hadn't ever had it before in Japan. Since we were a large group, we were seated in a semi-private area in the back of the restaurant, with our own chef, who cooked all of our dishes simultaneously. 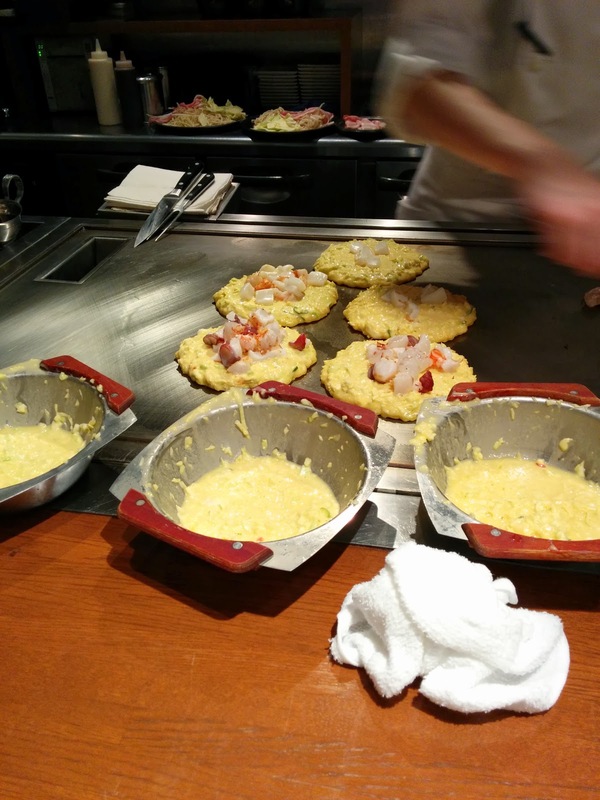 Part of the fun with okonomiyaki is either getting to cook it yourself (the servers just bring you raw ingredients and you are seated at a tepan), or at least watching the chef prepare it in front of you. It was actually really impressive watching him prepare so many different dishes at once. Watching the cooking was fascinating, but unfortunately, 3 of us wound up with food poisoning after this adventure, and I didn't think the food was great anyway, so I obviously wouldn't recommend it, and would not return. Starting the seafood and okonomiyaki. Our group had a number of orders: two people ordered the lunch special of pork and squid okonomiyaki, two of us ordered the seafood version, one ordered another type of okonomiyaki, two ordered one that included noodles, and one actually ordered a hamburger. 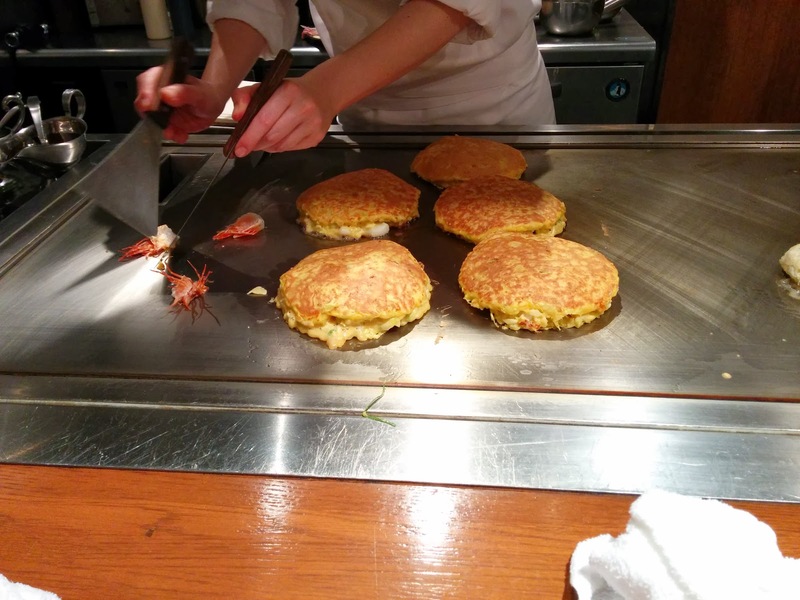 The chef started with cooking the seafood and the okonomiyaki bases, separately. 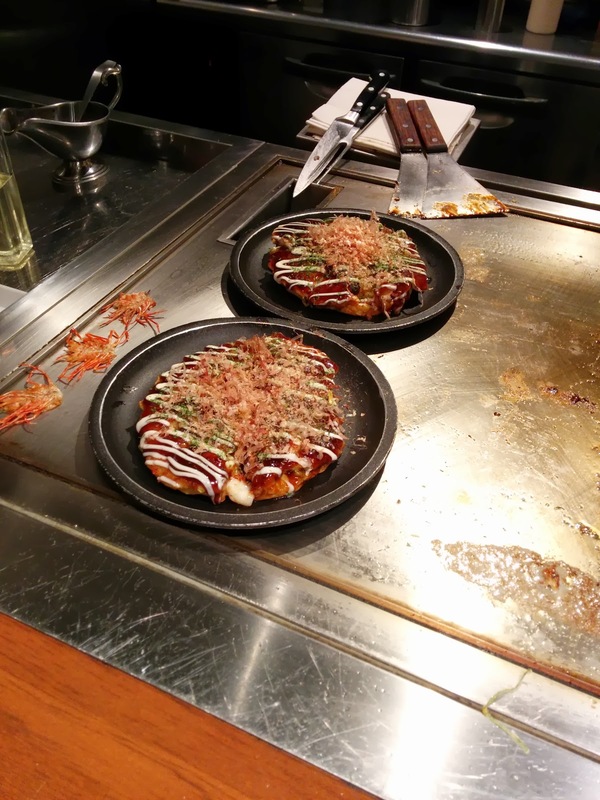 Each order of okonomiyaki came with its own big bowl of batter, and the chef never mixed from one to another. We were all pretty mesmerized, guessing which one belonged to each person. Adding seafood to the okonomiyaki. After the seafood cooked on its own for a while, it was added to the okonomiyaki batter, which had also been cooking on its own. Then, more batter was poured on top, again, each from the proper bowl. Once the it cooked this way a little, the entire things were flipped. Again, we had fun watching, but there wasn't any interaction with the chef, probably due to the language barrier. I wish it could have been a bit more interactive, but it was still fun to watch. 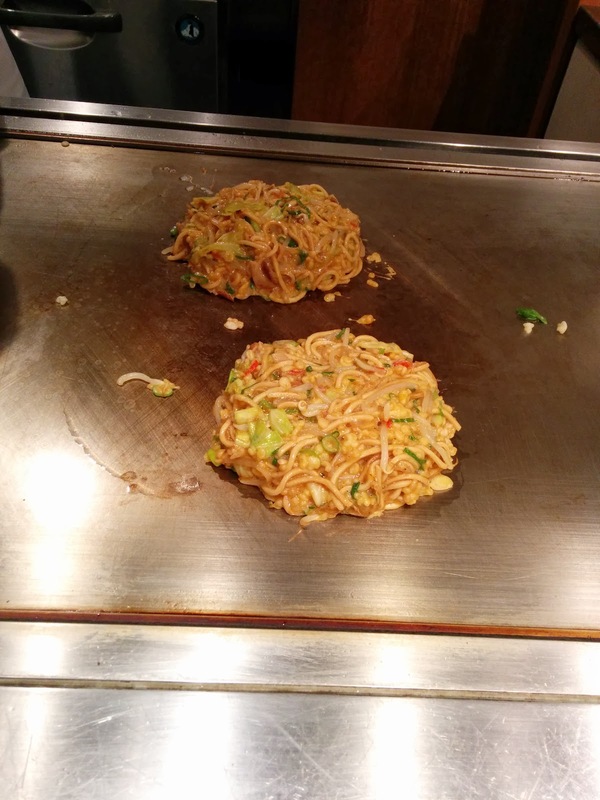 The regular okonomiyaki were left cooking on the side of the grill, as the chef started in on the noodle based versions, stir-frying up the noodles as if they were a stir fry, before they turned into massive pancakes too. 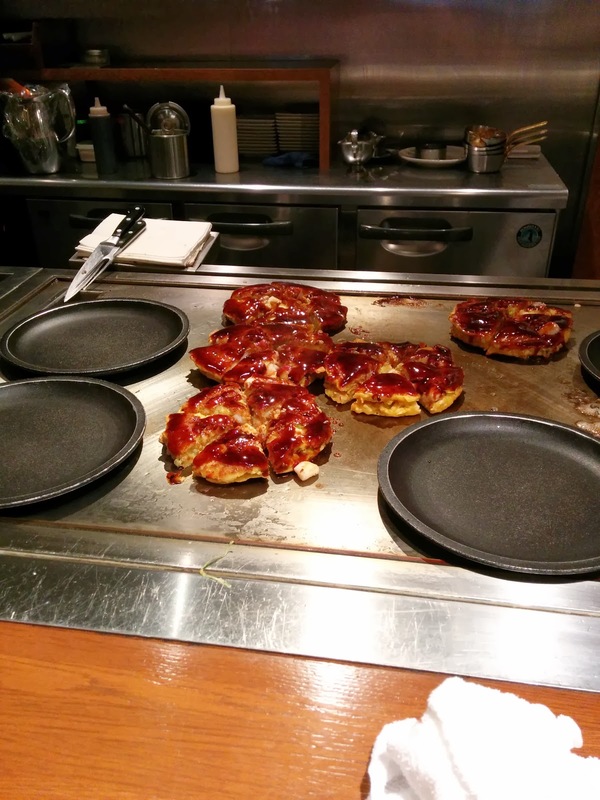 Once fully cooked, the okonomiyaki were sliced into wedges, and slathered with sweet sauce. And finally, topped with a ton of bonito flakes. I was a bit confused when I tasted it, as it tasted a lot like bacon. I ordered the seafood version, which should have included squid, scallops, and shrimp. Not bacon. Hmm. But I figured it must just be the flavoring somehow. So I continued. I found a few bites of seafood, squid. It was pretty flavorless and rubbery, and not very good. Besides that, I couldn't find any seafood. This was very surprising, since I had seen him cook it, and into each seafood one went a rather insane amount of seafood. Huge prawns and several scallops should have been in there too. I kept trying more bites, thinking the distribution was just wrong. Still only the rubbery squid, and seriously, it tasted like bacon. I asked if anyone had received the wrong one, specifically asking the people who ordered the lunch special of squid and pork belly. They said they had the right ones. I know that two seafood were made, and two lunch specials, so it wasn't like they made the wrong ones. I was confused. I looked over at Emil, sitting next to me, who also ordered the seafood version. His very clearly had scallops. And shrimp. What? Where was mine? At this point I looked very closely at the one that another co-worker was eating, who claimed several times that he had the correct one, and saw shrimp and scallops in his. Doh. I had his lunch special, and he had mine. I really didn't like it. First, I like pork belly and bacon, so it wasn't just the filling choice. The squid was not well prepared. But the biggest issue is that it was all just really, really dry and overcooked. I think we suffered from the fact that we ordered so many different things, and the okonomoiyaki were left cooking for along time while the other dishes were finished. Emil realized there was no way he was going to finish his entire dish, so offered me up several slices. I dug into that one, the seafood one, and liked it more. Most of the seafood was still overcooked for my liking, but the shrimp wasn't too rubbery, and the scallop was actually pretty good. The squid in the seafood one contained more assorted pieces than in the lunch special version, but was still way overcooked. The pancake wasn't quite as dried out, but it was still pretty dry. So, still not a winner. But, the best part of okonomiyaki is always the toppings. They didn't disappoint: the sauce was sweet, the mayo creamy, the bonito very flavorful. 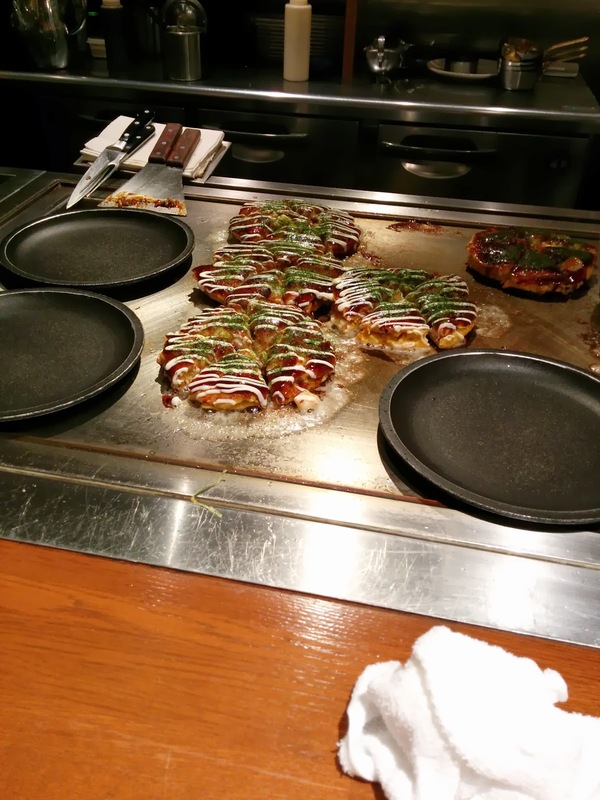 I ate more of the okonomiyaki than I really wanted, just to have more of the sauces. 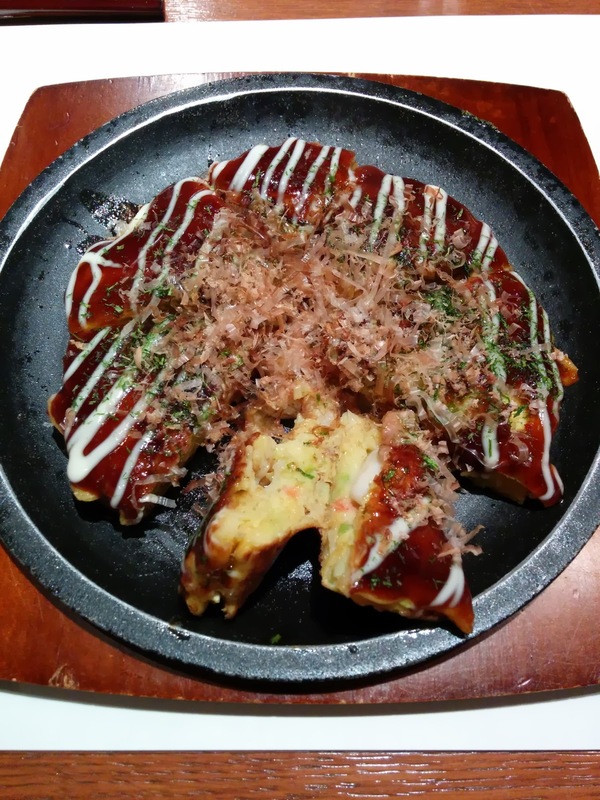 Overall, I think okonomiyaki is just not a dish I like that much, but this was a particularly poor execution. Very soon after eating, I got a major stomach ache. At first I thought it was just from overeating, but it was pretty extreme, and soon after, two others (who both had the seafood version), were also complaining about not feeling well. One of them turned so green that I really thought he was going to throw up on our elevator full of men in suits. The price for the seafood version was ¥1,680, which was reasonable, giving how much seafood went into it. I think two people could easily split one of these with no problem. We rented a stunning villa, right on the beach. We arrived late at night, so were not able to see anything about our surroundings. The next morning, we needed breakfast, and decided to take a stroll down the beach, and wound up at Playero, which I'd read about before arriving. You couldn't beat the easy walk, literally right out our front door, and along the beach. At a relaxed vacation-mode pace, it was less than 10 minutes, all right on the beach. The location was excellent, literally, right on the beach. You could sit with your feet in the sand. Some seats had umbrellas or were otherwise shaded for those who were sun-averse. While it was a great location, the food was pretty mediocre, and pricey for what it was. I had of course read all of this in advance, but I hoped the TripAdvisor folks were wrong. Unfortunately, they nailed it. Beachfront. Slushy Drinks. Can't go wrong. Service wasn't super attentive. I ordered a drink that never arrived. But still. Location, and slushy drinks on the beach. We still opted to return (daily). I was a bit late to join my friends at Playero on our first visit, and was amused when I showed up to find them all drinking strawberry daiquiris, at 10am. Thoughtful folks they were, they had of course already ordered one for me too. The daiquiris were absolutely huge. They were not stingy in the addition of alcohol, even though we were ordering them so early in the morning. The first one I tried felt like a punch in the face from the alcohol, but I was quickly assured by the others that this feeling would go away. Indeed it did. I'm not sure if I just got used to it, or if it was better mixed once I got further into it, but I stopped caring about how strong it tasted after not too long. Danger, danger. 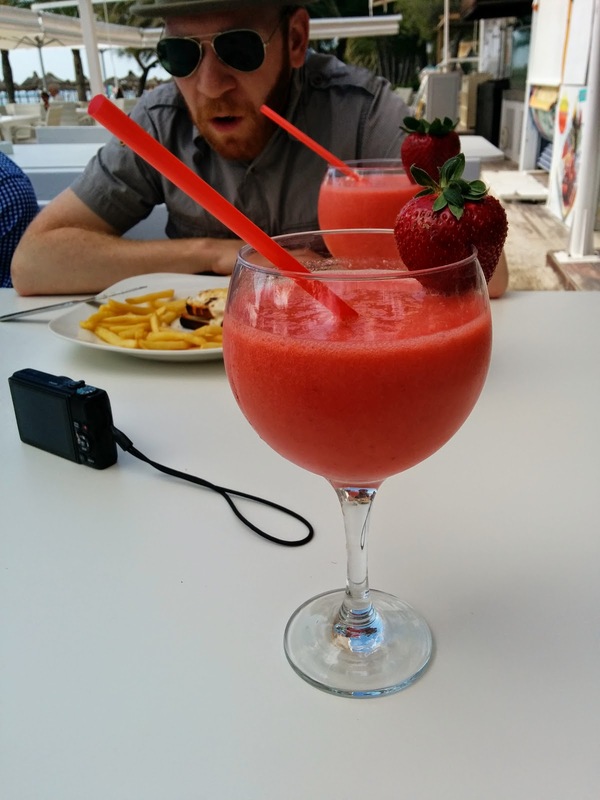 The daiquiris were decent, freshly made to order, nicely slushy. The best part for me however was the garnish. Each came with a large strawberry on the rim. And the strawberries were really, really good. Sure, the first one I had didn't seem washed, as it had dirt all over it. But, they were so sweet and juicy. I can't remember the last time I had a strawberry so good. Can't resist the slushy drinks! Over the course of our stay in Alcudia, we returned to Playero most mornings. The strawberries were always a highlight for me, and I appreciated the fact that some of my companions didn't care to just eat strawberries, and gladly gave me theirs. Otherwise, I would have needed to order even more daiquiris, just for the fruit. I read online that Playero made the best piña coladas on the island, so I had my heart set on getting one. 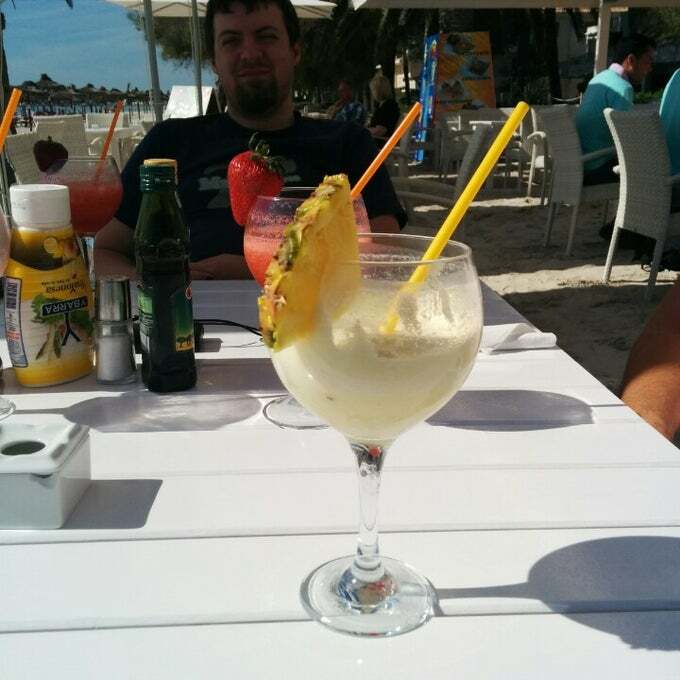 Sadly, it wasn't a great piña colada. I didn't really taste coconut, nor pineapple. It was really just sweet. Others ordered food on our different visits, but no one really liked what they got. One ordered a croque madam, but it came without the egg. Emil ordered the Pa Amb Oli sampler platter, I think expecting it to be an appetizer. Pa amb oli is a traditional Mallorcan dish, literally, "bread with oil". Instead of appetizer sized, or, even entree sized, it was a huge platter of 6 assorted pa amb oli, plus olives, peppers, and tomatoes. I helped him out with this, and even so, we didn't come close to finishing it. The server really should have warned us. The bread that formed the base of the pa amb oli was fine, nicely crusty, although a bit soggy from the tomato spread, but in a way that worked. But, neither Emil nor I are big bread eaters, so this was a bit lost. There was one piece with meat topping, Iberan ham. Emil liked this one the most. We had so much assorted ham and salami on this trip that I was happy to skip it, but a few others at the table ended up ordering a pile of just the ham because they liked it so much. Next was a trio of seafood options: anchovies, salmon, and tuna. I also didn't try the one with anchovies. I don't think Emil did either. The smoked salmon was fairly standard, decent enough, but not special. The tuna was ... interesting. Basically large chunks of what seemed like canned tuna. Not exactly high quality. There were two cheese options: manchego or blue cheese, each topped with nuts. I tried the manchego, it was fine, sliced thin, but never a cheese I really like. My favorite was the blue cheese. The cheese went well with the walnuts and the tomato base. I'm glad I got to try a traditional offering of pa amb oli, since the version we had at the Michelin star restaurant later that day was anything like this, but I certainly wouldn't get it again. The best part of the whole platter for me was the pickled peppers.